David Case said his dad also enjoyed opera, classical music and fine dining. Frederick was married to Roberta Elizabeth Case for 45 years, until her death in 1998. And besides being “a champion of his students,” Frederick Case was passionate about orchids, flowers, and nature his son said. Case was a founding member of the Saginaw Valley Orchid Society, his son said. Frederick Case wrote or co-wrote “Orchids of the Western Great Lakes Region,” “Trillium” and “Wildflowers of the Great Lakes Region.” He won the All Area Arts Award in 2002 from the Saginaw Community Enrichment Commission. “He also wrote numerous articles on plants, gardens and orchids,” his son said. “People worldwide visited his garden. Someone could call to ask him a question about gardening, and he would invite them over. They would most of the time leave with plants and his friendship.” Sharon Leaman-Case said her father-in-law once turned down an offer from Martha Stewart to take pictures of his garden. “She was just starting out on television and wanted to take pictures of his garden and interview him, but he didn’t know who she was, so he turned her down. I would always tease him about it,” she said. Earl Burnett was born on November 30, 1907 in Portland, Indiana. Earl Burnett passed away at St. Luke's Hospital on February 7, 1979. He was a graduate of the University of Michigan, receiving his Master Degree in Music. During his college days, Earl played in a dance band all over Michigan, Ohio and Indiana. At one point Mort Neff (from the TV show "Michigan Outdoors") was a member of his dance band. Earl played piano, base, banjo, guitar, and almost any other instrument that was needed. He held teaching positions in Ann Arbor and Mount Clemens before he was hired as Band Director and Head of the Music Department at Arthur Hill High School around 1939. He spent many nights and weekends designing and choreographing marching band formations for football games and parades. His wife, Marie, spent many weekends washing the spats that each band member wore for their performances. It was common to see fifty+ pair of spats hanging on their clothesline in their backyard. Earl and Marie were blessed with a son, Robert, in 1938 and a daughter, Mary, in 1947. Marie was a teacher also. She taught 6th grade at South Elementary until retirement in 1973. During World War II, Earl worked at "the gun plant" in Saginaw during the summer months. He often told his family that the windows in the plant were covered with dark paper so that spies couldn't see in. After the war ended he got a job with the City of Saginaw for the summer months. He drove an old jeep and sprayed trees with DDT (which is now banned). In his later years, Earl taught the "book work" for Drivers Education. He believes that he taught almost every student at AHHS. Plus he taught students from the parochial schools during the summer months. Hajar Busaid, a former Phoenix Union High School teacher passed away Sunday March 3, 2013 after battling cancer. She is survived by her two sisters, Adele Busaid McVey, Fairfax Station, VA; Freida Busaid Kahn, Peoria, AZ; her brother, Kamal Busaid, Surprise, AZ; and her nieces and nephews. Hajar was born and raised in Saginaw, MI, the daughter of Fouad and Maheba Busaid. She graduated from Central Michigan University with a BA in education and a MA in US History. She began her teaching career in 1961 in the state of Connecticut, returned to Saginaw in 1962 to teach at both Arthur Hill (her alma mater '57) and Douglas MacArthur High Schools where she taught English and was the varsity cheerleading coach. She moved to Arizona in 1973 and worked within the Phoenix Union High School District teaching junior and senior English classes, at East, Camelback, Central, and MetroTech High Schools. She continued to teach after her retirement in 1999 as a long term substitute at South Mountain High School. "Hajar was an impact teacher. She had an impact on most of her students." 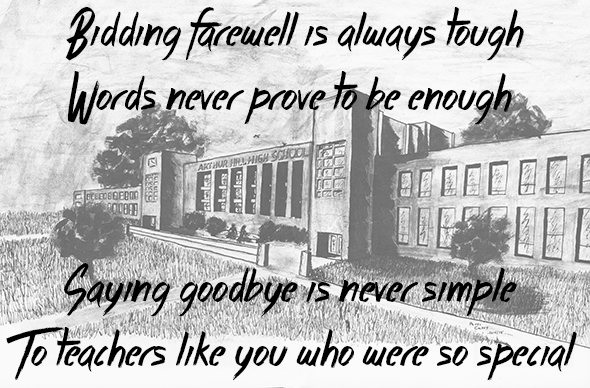 quoting a former student upon hearing of her passing. John Kring passed away on October 11, 2014, at the Cartwright Hospice Residence. Age 80 years old. The son of the late Merle and Thelma (Headley) Kring was born on March 18, 1934, in Petoskey, MI. John was a graduate of Alma College. While attending Alma College he was a member and co-captain of the football team. He married his college sweetheart Louise Roths on December 22, 1956. She survives him. As a recipient of the National Science Foundation Scholarship, John received his Master of Science degree in Mathematics from Southern Illinois University. His career in education began in Greenville, MI teaching and coaching for the public schools. John then moved to Bay City in 1961, as the Assistant football coach at Bay City Handy. In 1962, he moved to Saginaw where he taught mathematics and coached football at Arthur Hill High School. He started the wrestling program at Arthur Hill High School as well as in Greenville. His career advanced with the Saginaw Public Schools into administration as the Assistant Principal of Arthur Eddy and Central Junior High Schools. He retired in 1991. In 1998, John was inducted into the Bay County Sports Hall of Fame. After retirement, John continued teaching skilled math at Delta College as an adjunct professor. John was a member of the Saginaw Club and most recently the Saginaw Country Club. He enjoyed playing golf and loved sports. He was an avid duplicate bridge player. Surviving besides his wife of 58 years are two daughters, Katharine (Michael Dugan), Rochester, MI and Kristine, Saginaw, MI. Five grandchildren; Christopher, Madeline, Peter, Lauren, and Trevor; his sister, Gloria Hull, Petoskey, MI, and cousin, David Kring, Harbor Springs, MI. He was also predeceased by a brother Wayne Kring. The family would like to express their sincere gratitude for the kindness extended by the caregivers and therapists at HealthSource, Covenant Hospice nurses, and the caregivers at Cartwright Hospice Residence. Thelma "June" O’Dell of Saginaw, MI passed away Saturday, May 19, 2012 at home at the age of 90 years. June was born on June 24, 1921 in Saginaw, MI the daughter of the late Marvin and Thelma (Crimmins) Jacques. She married Sherman O'Dell in June of 1947 and he predeceased her on December 21, 2003. June retired from Saginaw Public Schools. She was a member of First Baptist Church, Saginaw Choral Society and the Saginaw Bay Yacht Club. Surviving are several nieces and nephews. She was predeceased by a sister Ruth Reed and brother Buddy Jacques. Hugh Shackelford was born and raised in the small Missouri town of Warrensburg. He passed away on February 27, 2006, at the age of 87. Hugh attended Central Missouri State Teacher's College, obtaining a B.A. in History. His father died when he was 18. He received his Master’s in Education from the University of Northern Colorado in Greeley. He taught briefly at a school in Missouri, and played clarinet in a jazz band on weekends until he entered the military during World War Two. While in training in Cheyenne, Wyoming, he met a young librarian named Carol; when he left for Europe, they corresponded regularly (she still reads his letters every day). He was a lieutenant serving over all black troops in a graves registration unit, and it made him a liberal (not the norm in his Southern Missouri family). He served in five campaigns. A young German prisoner of war assigned to him corresponded for many years, and visited him in 1995. Upon his return in 1945, he and Carol married and he began teaching at the Kemper Military Academy in Boonville, Missouri. One of his students was Hugh O'Brian (later TV's Wyatt Earp). He resumed playing in a jazz band on weekends. They had a son, then he was offered a job in Saginaw, Michigan, and began teaching and coaching basketball at Arthur Hill High School. Another son soon followed. Summers were spent visiting relatives in Missouri and Colorado, and Hugh earned extra money doing construction for the Denver Public Schools. Later, he taught typing and bookkeeping in summer school. He served on the board of the Team One Credit Union, and as business manager of athletics at Arthur Hill. He also enjoyed fishing in the mountain streams, as he did in the lakes and rivers of Michigan. He also enjoyed a good round of golf, and a good game of ping pong. In addition to teaching, he spent a brief time (too long for his liking) as Attendance Officer. He loved teaching history, and was always looking for ways to enrich his classes. He passed on this love of history to his son Martin, and his younger son Alan also eventually developed an interest as well. Hugh retired in 1980, and enjoyed his retirement years. Late in life, he experienced increasingly serious illnesses, and made plans to move to Madison, Wisconsin to be closer to his grandson. A week before the planned move, house already sold, he came down with pneumonia, and passed away on February 27, 2006, at the age of 87, after 60 years of marriage. His wife now resides in Madison, as do his two sons. Beloved husband, father and grandfather passed away after a lengthy illness, Thursday, March 27, 2014, at the Cartwright Care Center in Saginaw at the age of 75. The son of the late John and Marjory Jacobson was born June 11, 1938, in Saginaw, MI; He graduated from Arthur Hill High School in 1956 and joined the Army Reserves. Carl married Gail Davis, October 2, 1964. She survives him. He graduated from Alma College in 1961 where he was a member of Tau Kappa Epsilon fraternity. He taught and coached in Ashley, Michigan for two years and at South Intermediate School in Saginaw for 25 years. The last ten years of his career was spent teaching at Arthur Hill High School. During his retirement he enjoyed playing golf, attending sporting events, family gatherings and long walks with his wife. He also had an avid interest in U.S. History. He was an active member of Countryside Trinity Church where he served on the Board of Session and several committees. Claire Kelley Yost came into this world on Oct. 19, 1953. Even while waging a 22-year battle with breast cancer, Arthur Hill High School counselor Claire Yost helped achieve victories in young people’s lives, according to friends and relatives. Yost, 57, of Midland, who died due to the disease Dec. 3, 2010 worked as a special-education teacher and later as counselor at Arthur Hill, where she graduated from high school in 1972. “She was very mission-oriented and loved helping kids, and as a corollary she derived a lot of self-worth out of it,” said Duke Yost, 62, her husband. “When she took a kid who was maybe headed in the wrong direction and got him straightened out, that was the best.” Yost retired as a counselor in 2009, when Arthur Hill chose her as the school’s “Honor Alumna” for that year. Before becoming a counselor at the school, she worked as a special-education teacher there. . Yost also is survived by three children: Samuel Yost of Royal Oak, Caitlin Yost of East Lansing and Kami Yost of Valrico, Fla.
Claire was first diagnosed with breast cancer in 1988 and after two recurrences suffered a metastasis in 2002. Of her 22-1/2 years living with the disease, she was able to turn over twenty-one of them into pretty darn good ones with the caring help of Dr. Michael Hurtubise, nurse Pam Topor, and the wonderful staff at East Central Oncology. Despite having a built-in excuse, she maintained an unparalleled love of life and took the fullest advantage of her time here. Besides devoting extensive personal time in relation to teaching, she was an active and enthusiastic and member of the Unitarian Universalist Fellowship of Midland, both embracing and embodying their belief of acceptance and inclusion. She loved to travel, and did so widely and well. She was also involved in Friends of the Grace A. Dow Memorial Library, the Saginaw Education Association, and a bewildering array of book clubs and quilting events and activities. Intriguingly, she was a founding member of the Midland Streetwalkers Association (as featured in the MDN). She was a quick and ready volunteer at these and other occasions and she maintained a vital and active presence in this world until shortly before her passing. She always came with her irrepressible smile to warm the room, and she will be sorely missed by the many friends who both sought her out and sustained her. It should stand as great comfort to us all that these many good and beautiful people are still with us. Saginaw School District Board of Education Vice President Beverly J. Yanca said Yost was “like a beacon of hope, a ray of sunshine — when a student walked in her door, no matter what the student’s problem was, she was the ultimate student advocate and she would find a way to help that student out.” Yost taught at several elementary schools and Saginaw High School before joining the Arthur Hill staff in 1988. She won The Saginaw News 2009 “Diamond Award,” given to an educator recommended by parents, former students or peers. “I know it’s a cliche, but as educators, you always hope you will touch a life,” Yost told The News in a 2009 interview. Peter Derheim passed peacefully in his sleep December 26, 2009, at Health Source following a lengthy illness. He was 87 years old. Peter was born May 10, 1922 in Tappen, North Dakota, one of seven children of the late William and Katherina (Krein) Derheim. He was a graduate of Tappen High School, received his Bachelor of Science degree from North Central College, Naperville, IL, and his Masters of Education degree from University of Michigan. A proud U.S. Marine, Peter served his country as an aviation electrician stationed in the Pacific from March 1943 to February 1946 and ended his military service as Staff Sergeant. Peter began his teaching career in Epping, ND; a year later he moved to Saginaw where he taught science classes and, later, served as Assistant Principal at the former Webber Junior High School. He enjoyed 18 years at Webber before transferring to South Intermediate as Assistant Principal in 1970. Because teaching was Peter’s real love he returned to the classroom, teaching science and working in the Guidance Center at Arthur Hill High School for 12 years before retiring in 1984. In retirement golf became a passion and he played nearly every day during the season. Gardening and photography were also special hobbies, as was traveling. When his children were younger, many family camping trips around the country were used as ‘mobile classrooms.’ Peter met and married Dorothy Marks June 7, 1952, at First Baptist Church, Saginaw, where they have been members for 57 years. Through the years Peter served on various boards and committees, taught Sunday school, ushered and helped build the addition on the original church building on Johnson Street. Peter was a faithful and committed husband and father and touched literally hundreds of lives in his 33-year teaching career. Left to mourn his passing are Dorothy, his wife of 57 years; three children: Karen & Tom Randall, Edmond, OK; Alan & Michele Derheim, Manchester, MI; Don & Diane Derheim, San Francisco, CA; five grandsons: Jakob, Luke & Paul Derheim, Manchester, MI; Konrad & Evan Derheim, San Francisco, CA; two sisters and one brother: Martha (Ervin) Stadel, Jamestown, ND, Tobea Chapman, Lewiston, ID, and Walter Derheim, St. Paul, MN. Three other siblings predeceased him: Mary Stellema, Paul Derheim, and Tillie Doerr. Special brothers and sisters in-law include Stanley & Juanita Marks, Stuart, FL, Kathleen Stewart, Canton, MI; Kenneth and Madge Marks, predeceased Peter; also many nieces and nephews. Vincent Luther Combs, age 53, passed on Tuesday, November 22, 1994 in his home. He was a native of York County and the eldest son of the late Norman V. "Tiny" Combs and Annette Banks Combs, of York County. He was a member of New Bethel Baptist Church and a veteran of the U.S. Air Force. He was a graduate of the University of Michigan, Ann Arbor where he coached basketball under Johnny Orr. He taught in the Saginaw public schools and Arthur Hill High School systems. He also taught and coached basketball at the University of San Francisco and was employed by the Inglewood public school system at the time of his death. During his coaching career, he received numerous awards and honors. He is survived by his mother, Annette Banks Combs, of York County; four sisters, Shirley Juanita Berga, Annette Deloris Hopson, Barbara Jean Burge and Kim Denise Combs; three brothers, Carlos Clavton Combs, Lonnie Darnell Combs and Keith Rezon Combs; and a host of aunts, uncles, nieces and nephews. Edward Periard was born on March 19, 1949. He was killed in a motor vehicle accident in Birch Run Township on December 21, 1994 at the age of 44. Ed was the defensive coordinator for Arthur Hill High School's undefeated, unscored upon football team (1973 season) and later became head baseball and football coach for the Lumberjacks. He also coached football at Birch Run High School. Mr. Becker of Gladwin died Tuesday, June 3, 2003 at MidMichigan Medical Center–Gladwin following a long battle with heart complications. He was born in Saginaw on April 24, 1919, to Agnes (Gray) and Hiram M. Becker. Both preceded him in death. He attended the Bridgeport–Saginaw Schools and Central Michigan University. He spent his entire career in the fields of education and athletics. At Saginaw High, he starred in football, acting as captain of the 1936 team and receiving Saginaw All Valley honors. 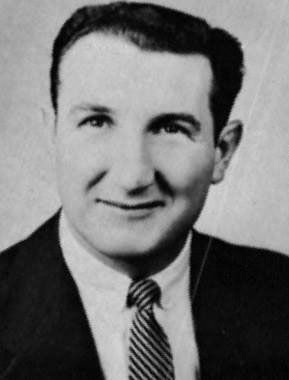 At Central Michigan, he captained the freshman squad and helped his varsity teams to an 18–5 record in three seasons and captained the 1940 squad. He was an outstanding tackle from 1938–1940 and went on to become one of the most successful prep football coaches in Michigan history. He also served the University as president of the men’s Union Board. He taught and coached at Chesaning, Ithaca, Cadillac, Bay City Handy and Saginaw Arthur Hill for a total of 25 years, winning 10 conference titles posting seven undefeated seasons and twice-named Coach of the Year. His teams at Cadillac won 26 straight games and the 1950 State title. Moving to Bay City Handy in 1960, he rebuilt a struggling program and in two years claimed the State Class A title. Leaving Bay City, he moved to Saginaw, his hometown, to coach at Arthur Hill. He guided the Hillites to a record of 25-13-2 over the next five years. He was fortunate to coach his oldest son, Hiram. He retired from coaching in 1966, but continued to teach until 1981. He was inducted into the Michigan High School Coaches Hall of Fame in 1984, the Central Michigan University Hall of Fame in 1995, and the Bay City Hall of Fame and the Cadillac Hall of Fame. He was also past president of the Saginaw Education Association. Hiram was also an outstanding instructor and leader at whatever he chose to do. He left his mark of humility, burning desire to win, honesty and fine conduct on an untold number of young men that he coached. His children and grandchildren will remember him as a wise counselor, a man to be respected, and a person who believed that being punctual, honest and courteous to others was important in life. His wife Beth survives him. They met in college and enjoyed a love and great friendship that lasted for 59 years. They enjoyed doing everything together. Also surviving him are his children, Hiram J. and Laura Becker of Saginaw, Robert Becker of St. Petersburg, Florida, Elizabeth and Dennis Greenwood of Freeland; three grandsons, Hiram M. Becker at MSU, and Alexander and Benjamin, both studying this year in Germany; sisters Jayne (Harold) Wilber, Ruth Raymond, and a brother, Jack H. (Gloria) Becker, all of Saginaw; a very special sister-in-law, Lucy Booth Bradley of Newberry; many nieces and nephews; and two dear friends, Dr. Don Borchard and Stanley Paskiewicz. Beloved husband, father, grandfather and great grandfather, passed away on Wednesday, September 19, 2012 at his home surrounded by his family. He was 86 years old. Ray was born in Columbus, Ohio on October 16, 1925, spent his youth in Centreville, Michigan and most of his life in Saginaw. Although he was afraid of heights, he enlisted in the U.S. Army Air Corps and became a Flight Officer (Bombardier) during WWII. He married Margaret Eleanor Abshire in St. John’s Lutheran Church in Three Rivers, Michigan on August 31, 1946. They recently celebrated their 66th wedding anniversary. They lived in Kalamazoo while he attended Western Michigan University, and while there he joined the Michigan National Guard as an Infantry Platoon Leader, 1st Lt, Company C. 1st battalion, 126 Inf. Reg., 46th. Ray taught as a vocational education coordinator in the Saginaw City Public Schools for 37 years, at Arthur Hill High School and the Career Opportunities Center, retiring in 1987. He was a life member of the Michigan Education Association and the National Education Association. At Arthur Hill High School he taught retailing, placed and coordinated students on jobs, ran the student store and created and operated the school’s concessions at ball games. He organized the Co-op Club at Arthur Hill, was co-organizer of the Saginaw Valley Association of co-op clubs and the Michigan Vocational Coordinators Association, of which he was past president and board member, was named “State Vocational Coordinator of the Year” in 1983 and also listed in Who’s Who among vocational coordinators. He taught evening classes at Bay City Jr. College, Delta College and the Saginaw Adult Education Center. He served in the Kiwanis Club of Saginaw Riverside for 31 years as the secretary, treasurer and bulletin editor and publisher. He was instrumental in promoting and working on their Vial of Life Program, Friendly Saginaw Program, Courthouse Clock Tower Project and many other services projects for the city and youth of Saginaw. He was presented a life membership in the Kiwanis Club of Michigan. He was a member of Resurrection Lutheran Church in Saginaw, where he served as chairman of the buildings and grounds committee, secretary and vice president of the church board. He loved people and liked to be referred to as “the man that told jokes” or “here comes Trouble” for he loved to make people laugh, and chose that as his retirement project. He loved to raise tomatoes and roses, was an avid card player, played golf, and bowled. Surviving are his loving wife, Margaret Hartman; three daughters: Connie Rae (John) Greenamyer of Angola, Indiana, Patti Lynn Hartman of Saginaw, Michigan, and Judy Jo (Tod) Swann of Alexandria, Virginia; six grandchildren; Stacy (Dan) Smith, Lee (Jenny) Greenamyer, Kelly (Grant) Wogomon, of Angola, Indiana, and Amy Greenamyer of Chicago, Illinois; Taylor Swann and Travis Swann of Alexandria, Virginia; seven great grandchildren; a sister, Barbara Bush of Paw Paw, Michigan; also surviving are many nieces and nephews. He was preceded in death by his parents, Miles and Esther (Frankel) Hartman of Centreville, Michigan and two sisters and three brothers-in-law: Leah Mae (Fred) Sherman and Betty Jane (Charles) McFarland of Columbus, Ohio, and Earl Bush of St. Joseph, Michigan; and a great grandson, A.J. Smith of Angola, Indiana. Beloved husband, father, grandfather, great-grandfather, teacher and coach passed away Tuesday, November 4, 2004, at St. Mary's Hospital in Saginaw. He was 82. Mr. McCargar was born October 28. 1921, In Edinburg, Indiana, the son of the late John W. and Lucille (Laughery) McCargar. He married Elizabeth Raymond, Octobe1· 20, 1940: she predeceased him May 17. 1997. He graduated from Owosso High School In 1939, where he holds the school varsity record for the 100 yard dash and the 220 yard dash. The 100 yard dash record was tied in 1993. After high school he attended Western Michigan University. His education was interrupted when he was enlisted with the U.S. Army Air Corps, serving his country from 1942· 1945. He then resumed his education at Western Michigan University In 1948. He began his teaching career at St. Charles High School from 1948 - 1951. He then taught at Leslie High School from 1951 -1953. From 1953, 1954 he taught at Central Junior High School In Saginaw. Then from 1954· 1984 he taught at Arthur Hill High School until his retirement. While at Arthur Hill he was the Head Track and Field Coach, an Assistant Varsity Football Coach and Head Junior Varsity Basketball Coach. He was a member of Immanuel Baptist Church where he was very active. He enjoyed spending time volunteering for the Saginaw City Rescue Mission and watching his grandchildren play sports. His courage, dedication, and mild-mannered demeanor was a fine example and Inspiration to everyone who know him. He is survived by four children; James A. (Donna) McCargar of Hemlock, Catherine (Joseph) Black of Lapeer, David (Lynnea) . McCargar of Midland, Laura (Joseph) Bringer of Saginaw; 15 grandchildren; seven great-grand· children; brother-ln-law, John Raymond: and several nieces and nephews. He was predeceased by one son, John McCargar in 1985; brother Ora McCargar; and one sister, Mary Powell. Mr. Gerber, of East Tawas and formerly of Saginaw and Whitney Twp., died Sunday, October 11, 2009 at Tawas St. Joseph Hospital at age 74. He was born July 13, 1935 in Saginaw, the son of Arthur John and Henrietta Louise (Mitchell) Gerber. Mr. Gerber retired as Assistant Principal of Arthur Hill High School in Saginaw, serving in that position for 28 years. Prior to being at Arthur Hill, he was a school teacher for 5 years at North Intermediate School in Saginaw. He was a member of the Michigan Association of School Principals, the Tawas Elks Lodge, the Michigan Association of Retired School Personnel, and the Tawas Bay Yacht Club. He was a former member of the Elks Lodge in Saginaw and the Saginaw J. C.’s. Mr. Gerber graduated from Alma College and received his Masters Degree from Central Michigan University. Surviving are his wife Elizabeth, 1 son John (Jana) Gerber of Chesaning, 1 daughter Kathy Adams of White Lake, 1 granddaughter Jade Gerber, 2 grandsons Grant (Ashley) Adams and Kyle Adams and 2 sisters Barbara Devers of Huntley, Illinois and Beverly (Ronald) Emede of Sebring,Florida. Joseph Flynn was born in 1924 in New Jersey. He passed away in 1997 at the age of 72. He was a coach and teacher at Arthur Hill High School as well as head football coach at Saints Peter and Paul High School.